Iconic Dalston bookshop and community centre Centerprise closed late last year after Hackney Council seized its premises amid a bitter rental dispute. This somewhat ignominious episode marked the closing chapter in the history of a place that was a hub for intellectual activity in the area in the 1970s and 1980s. 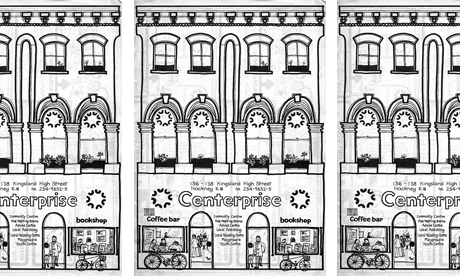 Centerprise began its life as a bookshop and café in Dalston Lane circa 1971. It is amazing to think now, given their proliferation in Hackney, but at that time there were virtually no independent bookshops in the borough. My father Robin Simpson was involved in Centerprise for most of the 1970s. He recalls: “We were told in 1970 that a bookshop would never work in the East End because East Enders didn’t read. In those days whole rows of empty houses stood on some streets in Hackney. Centerprise later moved to the Kingsland High Street premises where it was based until its demise last year. In its heyday the bookshop also contained a coffee bar and ran various youth activities such as chess clubs and drama clubs. There was a reading project, which taught adult literacy, and a publishing project, where local people wrote their autobiographies, as well as a legal advice centre. Like a number of organisations in the late 1970s and early 1980s – Geoff Travis’ Rough Trade label springs to mind – Centerprise was operated as a collectively-run enterprise as much as a commercial business. It attempted to capture something of the spirit of Karl Marx’s ‘For each according to their needs’ approach. Everyone was on equal pay and rotated duties. Rebecca O’Rourke, now a lecturer at Leeds University, was also involved in Centerprise during the 1980s, joining through her involvement with the Federation of Women Writers and Community Publishers. “Centerprise was a hub for Hackney life”, she says. “It was a cross-cultural space – the publishing and writing projects worked with mixed groupings of men and women, with people who were straight, lesbian, gay, and from a variety of races. Identity politics were strong when I joined the collective, and there were issues about race and sexuality which were sometimes very confrontational amongst staff. While the publishing arm of Centerprise would turn out to be its most commercially successful venture, the venue was also a meeting point for organisations and writers’ groups from all over East London, from Irish nationalists to feminist and lesbian groups. Sheltering from Augusto Pinochet’s brutal regime at that time, Chilean exiles in London would meet at Centerprise. However, it would be misleading to brand Centerprise as just a hang-out for hippies, intellectuals, and all the non-mainstream groups of the time. The local Communist Party, for example, didn’t meet there, and the Labour Party – then still staunchly on the Left – nonetheless viewed Centerprise with suspicion. Drugs and anti-social activity were not tolerated. The pressures of running a collective were not easy to bear, which may explain why its golden days eventually came to an end, taking its toll on many involved. The move to Kingsland High Street would lead to the organisation ultimately becoming more formal and hierarchical. O’Rourke remembers: “We lived the work and the politics of community activism. “It was one of the most hardest and stimulating times of my life – and it was tough for people with families. Most people who left did so because they were exhausted”. Worpole, meanwhile, says: “I think you have to remember that it was part of a much wider community arts movement. Apart from Centerprise, you had Freeform, Hoxton Hall, Chats Palace, The Factory… There were a lot of community arts projects, very committed to multiculturalism, very committed to popular creativity. “The idea at the time was cultural democracy, and I think those ideas are still very important. “To have all these different things under one roof – nobody had done that before. It was a magic mixture, if you like”. In more recent times, Centerprise contained a bookshop specialising in Afro-Caribbean literature and history, accompanied by a Caribbean restaurant and a space for community workshops. Up until its closure it was paying an annual rent of just £520 (£10 per week) – a situation that Hackney Council was dissatisfied with. These days, the area has become a strip of nightlife, full of revellers queuing for clubs. The houses off the main roads, the Hackney Peace Carnival Mural on Dalston Lane, and the Rio Cinema are all that really remain as symbols of the Dalston of the 1970s. The Kingsland High Street premises that housed Centerprise were, briefly, a ‘psychic medium’ centre, but this now appears to have disappeared. The walls have been painted black and the shutters are down. No sign pointing to the building’s previous history remains. On the Record Community Interest Company is developing a project to record the history of Centerprise’s publishing project and create a permanent public archive. They want to know how you think Centerprise’s work in publishing and community history should be remembered. They are collecting comments on their blog justanotherbookshop and can be contacted at info@on-the-record.org.uk or on 0758 365 6338.